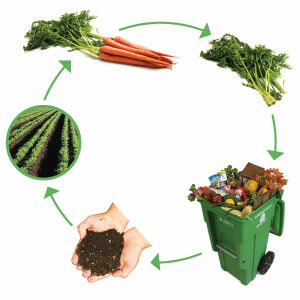 The composting process is a complex interaction between organic waste and microorganisms. The microorganisms that carry out this process fall into three groups: bacteria, fungi, and actinomycetes. Actinomycetes are a form of fungi-like bacteria that break down organic matter. The first stage of the biological activity is the consumption of easily available sugars by bacteria, which causes a fast rise in temperature. The second stage involves bacteria and actinomycetes that cause cellulose breakdown. The last stage is concerned with the breakdown of the tougher lignins by fungi. Central solutions are exemplified by low-cost composting without forced aeration, and technologically more advanced systems with forced aeration and temperature feedback. Central composting plants are capable of handling more than 100,000 tons of biodegradable waste per year, but typically the plant size is about 10,000 to 30,000 tons per year. Biodegradable wastes must be separated prior to composting: Only pure foodwaste, garden waste, wood chips, and to some extent paper are suitable for producing good-quality compost. The composting plants consist of some or all of the following technical units: bag openers, magnetic and/or ballistic separators, screeners (sieves), shredders, mixing and homogenization equipment, turning equipment, irrigation systems, aeration systems, draining systems, bio-filters, scrubbers, control systems, and steering systems. The composting process occurs when biodegradable waste is piled together with a structure allowing for oxygen diffusion and with a dry matter content suiting microbial growth. Biodegradable wastes must be separated prior to composting: Only pure food waste, garden waste, wood chips, and to some extent paper are suitable for producing good-quality compost.The temperature of the biomass increases due to the microbial activity and the insulation properties of the piled material. The temperature often reaches 65 to 75 degrees C within few days and then declines slowly. This high temperature hastens the elimination of pathogens and weed seeds.